Atlantic Monthly Press, 9780802119421, 262pp. 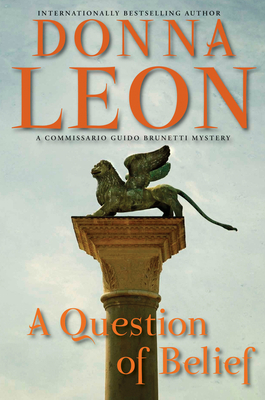 Donna Leon's best-selling series featuring the principled, warmhearted Venetian Commissario Guido Brunetti has won her countless fans, critical acclaim, and international renown as one of the world's best crime writers. In A Question of Belief, Brunetti must contend with ingenious corruption, bureaucratic intransigence, and the stifling heat of a Venetian summer. With his hometown beset by hordes of tourists and baking under a glaring sun, Brunetti's greatest wish is to go to the mountains with his family, where he can sleep under a down comforter and catch up on his reading. But before he can go on vacation, a folder with court records has landed on his desk, brought by an old friend. It appears that cases at the local court--hardly known as a model of efficiency--are being delayed to the benefit of one of the parties. A creative new trick for corrupting the system, perhaps, but what can Brunetti do about it? And just when it looks like Brunetti will be able to get away, a shocking, violent crime forces him to stay in Venice. This is a stellar addition to Leon's celebrated series: atmospheric, packed with excellent characters, and building to an explosive, indelible ending.